It was an innocent enough idea, struck by the speed with which I was regaining my run legs and having recently updated my training diary to include the missing six months of data, I wondered – what could it show me? I hadn’t anticipate the hours I’d lose sifting through my logs, trying different charts and looking for patterns. I wasn’t expecting a miraculous sign, but four years of logged runs must have something to say. Once I fired up Excel – actually it was already open, it always is – and started pulling in data from WKO+ my evenings were gone. 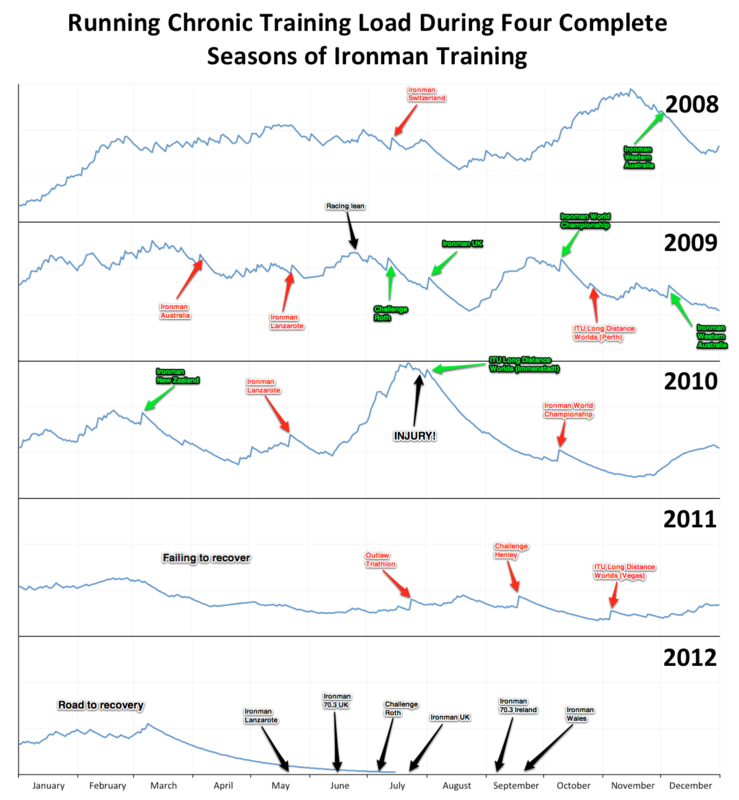 I wanted to see what the last four years really looked like – a broad picture of how I’d actually trained. Chronic Training Load (CTL) seemed a simple way to summarise such a long period. As one of the three elements in a Performance Management Chart (PMC), CTL is a proxy for fitness, combining the effect of intensity, duration and frequency of training; broadly as you work more your CTL will rise, you’re building fitness. In isolation it’s not necessarily a great indicator of performance, high CTL indicates high fitness and certainly the potential to perform at our best, but other factors come into play. While the PMC also attempts to model the impact of fatigue through Acute Training Load (ATL) and Training Stress Balance (TSB) I decided to focus on my level of fitness throughout each year. 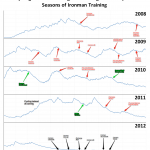 I was more interested in comparing the low, but rising fitness of the present day with seasons from the past. A lot of training and a lot of racing. 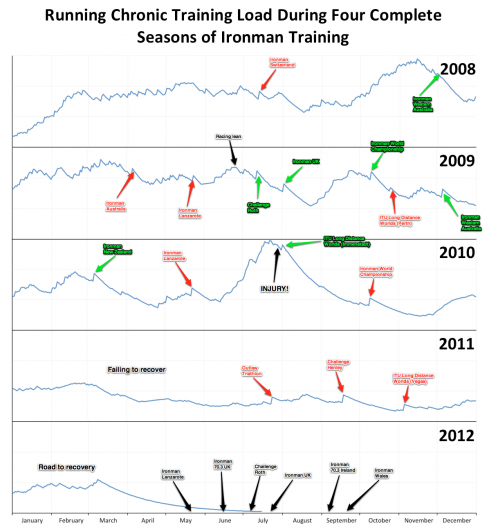 The rise and fall of the blue CTL line reflects the variation in run training, races are marked subjectively – green for a successful run, red for a poor performance. Each year is to the same scale, so the peak at the end of 2008 is of similar magnitude as that in mid-2010, what the graph doesn’t show is the exact nature of the build: in 2008 I incorporated brick runs after every bike in addition to regular run training, in 2010 I neglected cycling to run very high volumes. 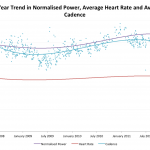 The consistency of 2008 surprised me, for the first seven months I was working in London, it was easiest to fit running around my job, but when I left and travelled to Australia cycling dominated the schedule; that I carried consistency through to 2009 without significantly progressing fitness is a consequence of that bias. The turning point in 2009 was part consistency, but also changes in body composition – losing some ballast had a major impact on run performance. From mid-2009 onwards I had a good run, a series of successfully executed races and a real sense of progress, but returning from New Zealand and ending my sabbatical brought it to an end. I’ll admit I didn’t enjoy the reality check and struggled to bring back good form; that year Lanzarote was raced on half-fitness and too much weight. I followed with that second major run peak, achieved off the back of too low a base (i.e. a period of low CTL, indicating relatively low levels of training). The rapidity with which I chased mileage targets made an overuse injury almost inevitable; it may have occurred after the fact, but the damage was likely done in that month of climbing CTL. Enough fitness to pull a good performance out for the ITU Long Distance Worlds, then it was downhill fast. I was never run fit in 2011, not by the standards of previous years, but when you average ninety minutes running per week, it’s hard to be good at racing marathons. An initial attempt to build up running failed, by March my calf was causing me pain again, that was a key moment. I finally dealt with the issue. Rest, then analysis with Kinetic Revolution and a slow progression back to some run training. It held me together and slowly the calf was able to heal even when I hindered the process through races and training camps. What can be learnt from the year? It doesn’t take huge fitness to run an Ironman, but it helps; it does require careful pacing when fitness isn’t there; and it definitely requires good bike fitness. More importantly – had I been as proactive back in 2010, my 2011 season might have been very different. Idle speculation of course. I am recovered, free of pain and free of tension in the calf; I’m enjoying running again and finding that while I’m not as fit nor as light I feel more like the runner of 2008 than 2010. That’s progress. This brief review shows me that I don’t necessarily need to reach the greatest peaks to achieve the performances I want, but when I’ve been at those points my running steps up. What’s obvious is the application of work to achieve that level needs control – the chase of 2010 was a disaster, the more moderate build of 2008 worked. If I choose to place that focus on running again I have to adopt a cautious approach, growing fitness slowly and steadily; 2011 has left me with weak foundations. Obviously I’ve produced a similar chart for cycling, there is more of this data trawl to come, and with greater detail I’ve delved further into broader topics. At the very least this process is a reminder of the value of patience and consistency in my progression as an athlete.